On Menorcas Northern coastline, Fornells Spain, is a prime example of a one time small traditional fishing village adapting to tourism as its prime source of employment. Thankfully it has done so without losing any of its original Spanish charm and unique character! Providing a natural anchorage and extensive mooring facilities Fornells is now a popular destination for yachts traversing the mediteranean and land based visitors wishing to enjoy the wide range of aquatic sports in the harbour and lagoon. Offshore is Menorcas marine reserve which provides ample and protected diving locations. Upon the Eastern side of a narrow peninsula the town of Fornells Spain provides a natural anchorage to passing yachts and small ships. From its early days as a center of the Menorcan fishing industry the waterfront is now given over to a promenade and restaurants serving seafood landed just that morning! The high quality and relatively low cost of such rich fare has contributed to the recent popularity of the town amongst boating types as well as visitors to Menorca who visit for lunch or an evening meal, al fresco, at the waters edge. After such fine dining, a walk to the end of the peninsula brings you to the old lighthouse and fort from Napoleonic times. 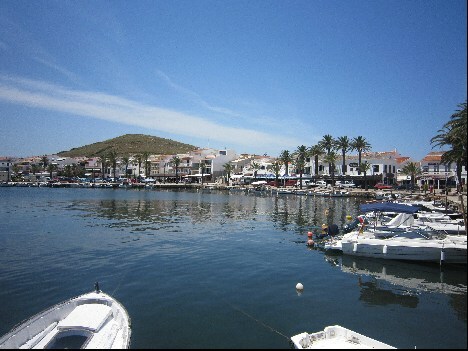 Visitors to Fornells should bear in mind that it is possible to explore the town and its surroundings in around just 3 hours. That is unless you are one of the many painters who descend on the town to capture seascapes, the marina or the lagoon. As Fornells Spain has tried to change from its dependency on fishing to becoming a tourist destination it has bet on watersports as its unique offering. Being at the center of Menorcas marine reserve and having its own extensive lagoon and anchorage made the choice pretty much an obligation! What this means for the visitor is that it is possible to practise or learn a different water sport every day of a two week holiday. Indeed the only restrictions are those affecting fishing within the marine reserve but charters go outside these waters to ensure that the aquatic offerings are complete. For those not staying in Fornells itself the town can be reached via two different roads depending on which end of the island your accomodation is. East - Leave Mao (Mahon) on the Me-7 going north until you reach Fornells. West - Leave Ciutadella on the ME-1 direction Mao (Mahon) until you reach the town of "es Mercadel" from there take the Me-15 direct to Fornells. 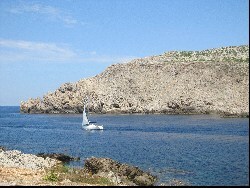 In addition to driving oneself there are regular bus services to Fornells Spain from the rest of Menorca. If you try the Caldereta de Langosta expect to pay around 60€ for two people. A cheaper alternative is the one person Caldereta de Marisco (seafood) which comes in at a respectable 17€ as part of a 3 course menu.